Our company is one of the leading providers of Concrete in Chicago. It is no surprise that our clients return to us time and time again for a concrete needs. We certainly do hold a solid reputation throughout the city! Our highly skilled workers have many years of experience, and for that reason they are able to provide not only a reliable service, but a fast one as well. You will not believe the quality of the concrete job that we are able to provide you with. The jobs that we are able to do are numerous. We have a fantastic range of different concrete solutions. Our most popular service is the installation of all flat work in Chicago and the suburbs, however we have many more skills up our sleeves. Just ask us! Whether you want a customized remodelling carried out, or renovation to your existing concrete, we are here to help you out. We are sure that you don’t want to be hanging around for many days hoping for a reply from a concrete company. This is why we promise that all potential customers will receive a same day response from their point of initial contact. When you work with us, you will find that this is always our approach to work. We never want to keep customers waiting, we know they want a job done, and we know that they want it done as quickly as possible. On top of all of that, our pricing is incredibly competitive, and we are able to serve small to medium size residential and commercial premises. All of our work is backed up with a one year warranty. 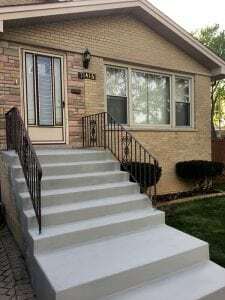 We are fully insured and bonded, which means you can trust us for all of your concrete projects, whether you live in Chicago or within the suburbs.